It’s close; but it’s not quite what I said. This story illustrates a fundamental difficulty we always must face when trying to put human language, be it Italian or English or mathematics, to the task of describing the universe. We will always be faced with miscommunications, mistranslations, or simple inadequacies. Hawking himself famously fell victim to such a mistranslation when he claimed his theory, that the Big Bang was triggered by a quantum fluctuation of the primordial space-time continuum, solved the age old question: “why is there something instead of nothing?” But the “nothing” of the primordial vacuum is not the same thing as the philosophers’ nihil. Even a vacuum contains the primordial space-time continuum—and the laws of quantum mechanics. 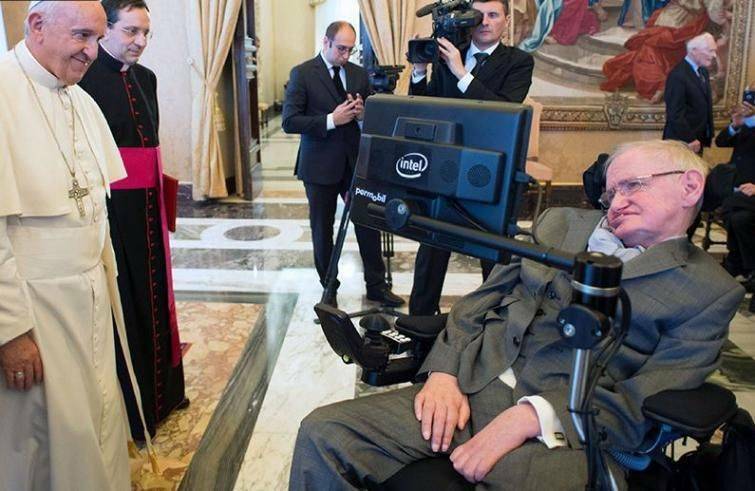 Though I never knew Hawking personally, the Vatican Observatory’s noted cosmologist Fr. Bill Stoeger studied with him at Cambridge in the 1970s and they remained good friends all their lives. Ironically, though they were the same age, Hawking outlived Fr. Stoeger by four years. Of course I was aware of the public persona, including his conscious decision as his disease progressed to market himself as a “genius” to the general public. The success of his books (which it seems everyone bought and no one read) insured that he could support himself as his disease progressed, and gave him a sense of value. But it also fed the mania of the media to deify celebrity science. Hawking was a good physicist. But he was not Newton or Einstein. His one memorable insight was seeing how black holes could “evaporate” via the quantum uncertainty that would allow an occasional bit to find itself outside the “Schwarzschild radius” and thus free to escape the black hole’s gravity. But Einstein’s Relativity predicted black holes, John Wheeler named them, and Karl Schwarzschild determined their radius. And while Hawking’s theory is convincing, it is still beyond our abilities to test. And yet Hawking could also be a very difficult person. He was a sinner. So are we all. The death of Stephen Hawking [on March 14, 2018] filled the news with plaudits for his science and his remarkable life. He was certainly the most famous scientist of his generation. But most of the eulogies missed that essential part of his story, one that he both suppressed and yet, I suspect, he longed for. He was after all an ordinary human being.